Let me open by saying that I love football. While I didn't attend the University of Arkansas, I have always recognized their importance to this state. While I enjoy banter with my friends who went to the hill, I never want them to lose unless they play a school where I attended. Having said that, Bobby Petrino needed to be fired, and Arkansas Athletic Director Jeff Long did what needed to be done, even if it wasn't popular with a large contingent of the Razorback fan base which was willing to overlook innumerable indiscretions as long as the Hogs had a chance to win the SEC West. However, I think Jeff Long took an action today that should make those associated with the program at Arkansas proud. Long has told the world that Arkansas values integrity and excellence, both on and off the football field. The easy route would have been to slap Petrino on the wrist and overlook all of this, but that would have sent a horrible message about the values of our state's largest higher education institution and the values of our citizenry. It also would have sent a horrible message to the student-athletes that Petrino led. Keeping Petrino would have said to all of the world that it is OK to lie to your boss. It would have said that it is OK to hire your outside mistress on your staff. It would have said that it is OK to be a lascivious and lecherous man of poor character as long as you win football games. I wanted to believe Arkansas was better than that. Jeff Long pleasantly surprised me. In the face of all the fan groups and boosters screaming that it was about wins and losses, Jeff Long said actions off the field matter too. Integrity is important. Honesty is essential. Character still matters. In a day and age where so many are willing to overlook so much in exchange for victories in sports. I am not a Hog, but I am an Arkansan. This episode has been embarassing for our state, until now. Jeff Long has taken action that shows what values are important. In the coming days, Razorback Nation will heal. The games will start, and from the mountains of Fayetteville to the Delta of Helena-West Helena chants of WOO PIG SOOIE will be heard across the state once again. 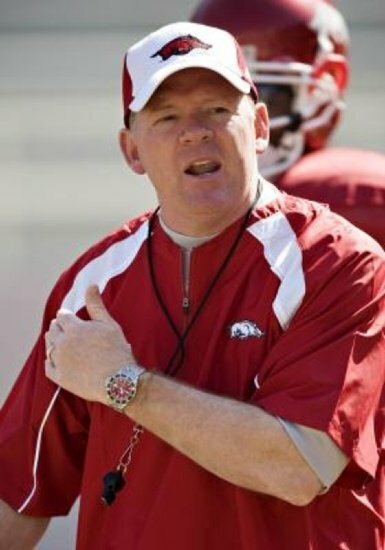 Petrino isn't the University of Arkansas program. The program will survive and thrive.